Konflict Motorsports is Moving to Austin, Texas! Seattle has been very welcoming to us, and we have been fortunate to spend ten years here, but we miss warmer climates along with family and friends. We will be relocating to Austin, Texas at the end of January 2019. Austin is in the heart of Texas Hill Country, which is an amazing locale with incredible riding. In many ways, Austin is a playground for off-road/motocross and adventure bike riding communities. With having every type of terrain imaginable, along with Colorado/Utah/Mexico being in our backyard we are looking forward seeing what these places have to offer. With Austin being centrally located within the US, this will shorten shipping timelines for our clients, allowing quicker turn around times as well allowing us to attend a number of races/events/rally's we normal wouldn't be able to attend. I am excited to make this move to Austin! This is something that has been in the works for a while and I am eager to see it all come together. The race series in Texas and surrounding states are something I personally look forward to attending, along with building our business while supporting the local community. We look forward to everything Texas has to offer and all the great things Konflict Motorsports will bring the the riding community. Our new shop is something I am proud of, its been purpose built and has a number of features our existing location could not provide. We've been in Austin a number of times over the last year checking the local riding scene, working with a number of the local riders and spent some time at the riding areas. To say we are excited for this next step would be an understatement!" Konflict Motorsports is Suspending operations from January 28th-February 4th to relocate. Please coordinate suspension shipments accordingly! Shipments may arrive at our new location on or after February 4th. We ARE accepting appointments during the move. Please contact us by email at info@konflictmotorsports.com, or submit your appointment request online HERE. We were interested in seeing what the newest version of the KTM LC8's were all about and, specifically the KTM 1290 Adventure R to have a test-bed for the newest version of the WP SPLIT ROTA 4860 fork, and 4618 DCC PA shock to complete our research & development as well to have a platform to test the products we offer. We encountered some difficulties with the 1290, but are going full out with this build showcasing our services and products we offer, keep an eye out for future blog post's! With that being said, our first impressions of the bike are extremely positive! We initially felt very comfortable on the bike, and impressed the incremental ergonomic adjustments KTM has made with it's Adventure platforms over the years. We opted to install small upgrades, like the Fasst Co. FlexxBars, and wider pegs to accommodate for adventure riding. The Rottweiler Performance intake system, which has drastically improved the performance of the motor, was our next addition. Next we wrapped it in a Black Dog Cycle Works Skidplate, to provide the best all-around protection possible. Electronic issues have traditionally plagued the first year models, and the 1290 is no exception - as the production cycles move forward many of these issues will be addressed in Austria, and we will see an improved overall package. For lighting solutions and upgrades - we chose to go with Cyclops Adventure Sports units. With the new KTM 790 ADV looming on the horizon - we are proud to say that we're still committed to R&D on all major makes and models to provide comprehensive applications for our customers suspension needs, and we're excited to see the mid-size adventure segment growing, and will be developing a 790 ADV as soon as we can get our hands on one. Lyndon had a great showing at the 2018 Dakar Rally on his Motorex Rally KTM - piloting his way to second in the Malle Moto class aboard his Konflict Motorsports tuned suspension. Check out his in-depth video log of the event, and his progress below. Konflict is happy to provide Rally proven suspension solutions to the general public, and back our setups with hours of testing and real world application and results. We can help you take your ride further, and we can address the issues with your setup! Events like the Dakar, and riders like Lyndon, are always pushing the boundaries of what is possible on a motorcycle - we're proud to be right there and finding solutions to keep elevating the sport. Konflict Motorsports, a suspension service provider, specializing in adventure and off-road motorcycles, has been supporting Lyndon Poskitt this year as he travels the globe training, preparing and racing rally events, ultimately ending with the 2018 Dakar Rally. 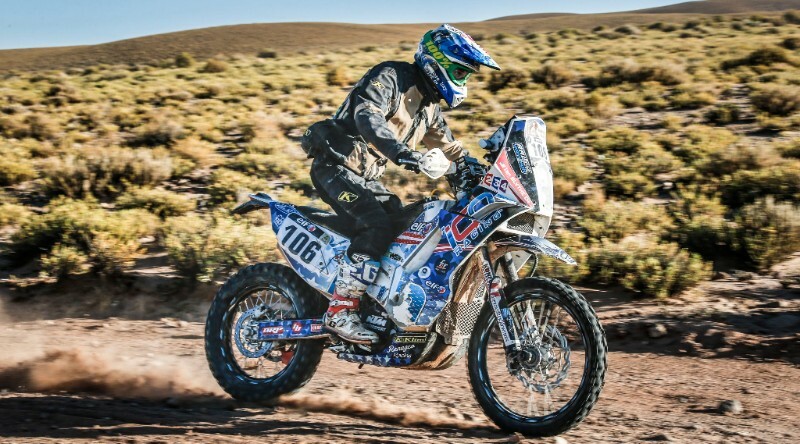 Poskitt’s unique and utilitarian approach to preparing for the Dakar Rally has him riding an adventure bike from race to race in a self-sustained manner, crisscrossing continents and countries. The tour is called “Races2Places,” and has a cult-like following among rally enthusiasts. As of this writing, Poskitt has crossed 88 borders, covered 112,512 miles and spent 1,155 days riding in both remote and urban environments since the inception of his worldwide touring and racing program. He has competed in seven rally events and is currently making final preparations for the 2018 Dakar Rally, beginning on January 6th in Lima, Peru. Poskitt’s campaign places severe demands on his suspension; performance and reliability equally critical, and Konflict Motorsports has earned his trust. The 2018 edition of the Dakar Rally traverses Peru, Bolivia, and Argentina, covering 5590+ miles over 14 stages. Poskitt competes in the “malle moto” class, regarded as one of the most difficult and purest of classes. Riders must perform all service work by themselves, with everything required coming out of a small official foot locker type container. Other teams are allowed to haul tires, mousses and spare parts, as it is impossible to fit them in the regulation container. FIM officials closely monitor the riders doing service work at the bivouacs, where malle moto riders must sleep in tents. 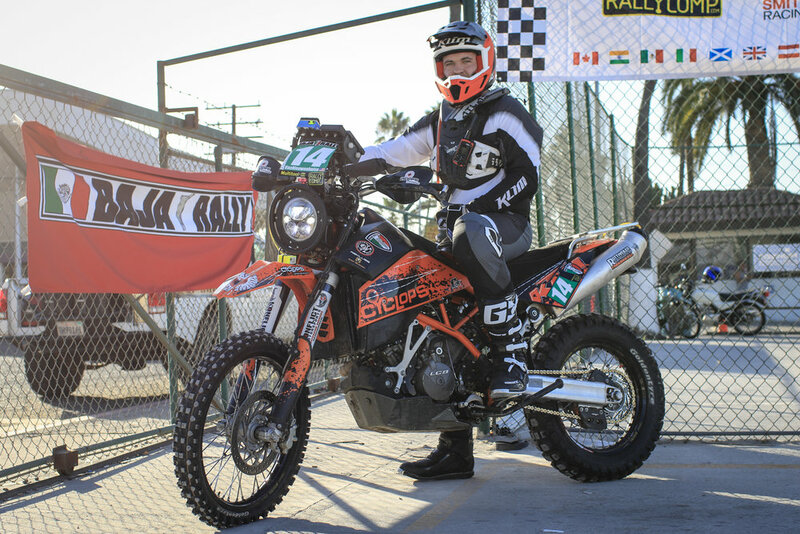 This independent, self-sufficient style of both Races2Places and the Dakar malle moto class has earned Poskitt respect from fans and fellow competitors, and in turn, he feels the same respect for Konfict Motorsports’ suspension services. Having suspension custom designed for his particular riding style, speed, ability, and preferences allows him to perform comfortably at his limits, while the dependability of the work and installed components keeps him moving forward during his worldly travels and races. For the last few months we have been building our new shop bike, Honda Africa Twin for a bike build to be featured in the January issue of UPSHIFT. Upshift is a new online magazine founded by Chris Glaspell and Simon Cudby that features incredible photography and content geared towards Rally, Off-Road, and Adventure. Konflict Motorsports & Suspension Inc. and Rally Management Services team to bring Rally Raid training to the PNW! Classroom style navigation training/instruction from some of the best navigators in the United States. Three days (60-100+ miles each) of road-book routes through some of the best scenery and challenging terrain Oregon has to offer! Two breakfasts and two diner's + snacks and drinks. All proceeds going towards Rally Pan Am in getting them to Dakar 2017! 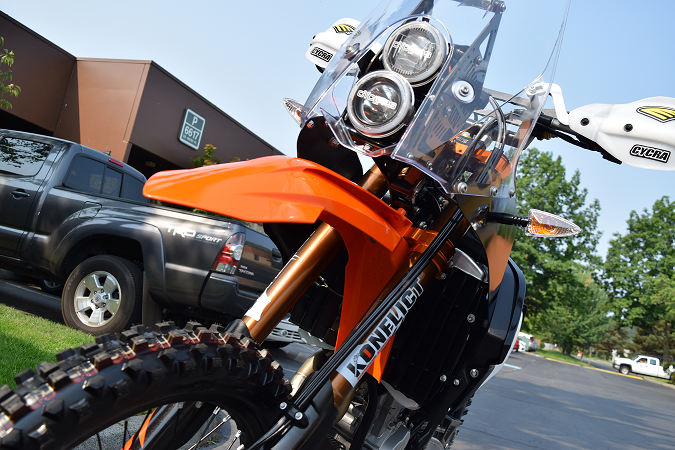 KTM 450-500cc equipped with complete Rally Lite Setups from RMS. Includes new tires & bibs. Rally Lite kits are available from RMS to utilize during the training and will need to be arranged with RMS during registration. We can facilitate transportation, lodging, and camping equipment for the event, please contact alex@konflictmotorsports.com to discuss what details you require. Many other forms of off-road racing, involve a lot of mental training. You need to know how to manage your bike and body and learn to navigate using only a road book and compass heading. We run small, private training events for our own Dakar team and for competitors preparing for international rallies. You will learn from experienced racers all about navigating, and keeping your head (and yourself) in the race. Recently described as "baptism by fire" by an attendee, this is focused, hard-core training, not a "weekend getaway" event. It's for advanced riders and racers who are breaking into the cross-country rally discipline. During our time off the bikes, we discuss all the other aspects of rally racing, from preparation to logistics to spares to fitness. There is a ton of information to learn about competing in an international rally. We have the knowledge and experience and would love to share it with you. Be sure to read this excerpt from the upcoming Rally Handbook to learn about RALLY NAVIGATION. Road book routes are being created in conjunction with High Desert Adventures, a motorcycle tour company located near Bend Oregon. 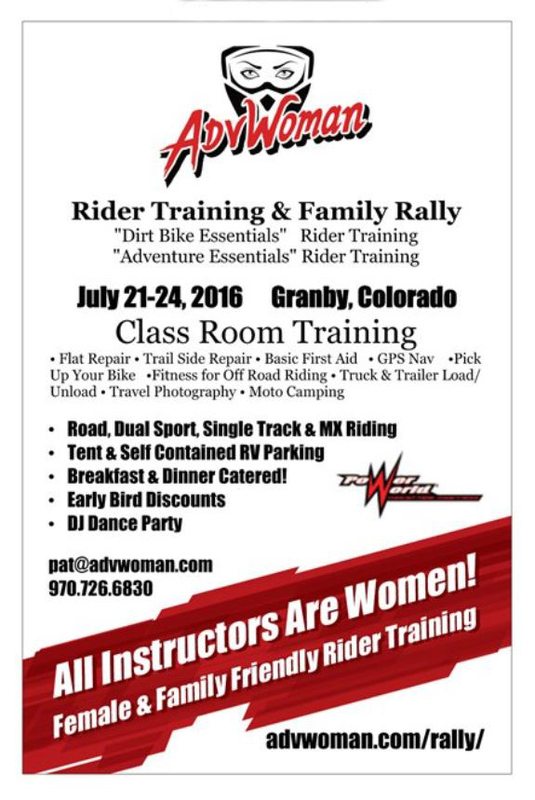 Contact: Alex Martens- Konflict Motorsports & Suspension Inc.
Konflict rider Pat Jacques has launched the ADVwoman Adventure Rally being held in Granby, Colorado this summer! GRANBY, COLORADO, April 13, 2016 – Power World ADVWoman Rally Announced July 21-24, 2016, at Flying Heels Rodeo Arena in Granby, Colorado. Pat Jacques and Power World motorsports are organizing the first-ever motorcycle adventure rally targeting women and families. To be held July 21-24, 2016, in Granby, Colorado, the event will include classroom sessions as well as on-range dirt bike essentials and adventure essentials rider training. All instructors are women! Men are welcome too; this is a female and family friendly rally. Classroom Sessions are open to all attendees and will run Friday & Saturday 3:30PM-4:30PM and 4:45-5:45PM, with several classes running simultaneously in different locations. Topics include trailside maintenance, trailside first aid, intro to GPS navigation, fitness and training for off road riding, truck & trailer motorcycle loading and unloading, flat tire repair, how to pick up a bike, moto-camping and travel photography. Base Package plus Rider Training $277.00.  Includes everything in the base package, plus one day of rider training in either “Dirt Bike Essentials” (small single track bikes) or “Adventure Essentials” (dual sport and adventure bikes) with options for “women only” classes. Each class is taught by two highly qualified women instructors and is limited to 15 riders. Base Plus Plus package $347.00  Base package plus two days of rider training both Friday and Saturday. Take “Dirt Bike Essentials” one day and “Adventure Essentials” the next day. With options for “women only” classes. Each class is taught by two highly qualified women instructors and is limited to 15 riders. There is an early bird 10% discount on each package if registering before May 7, 2016. “Make no mistake. We may be teaching motorcycling, but what we’re really doing is empowering women!” said Jacques. About Pat Jacques, Rally Director: Pat Jacques is a ground breaking woman who raced men’s motocross professionally. Retired from racing now, she still enjoys spirited single track riding and adventure touring. Jacques’ passion is empowering women and getting families out riding motorcycles together. She is a Keynote speaker appearing at the Steel Horse Sisterhood Summit, Women Creating Our Futures, and a personal coach. The guys from Icon Raiden teamed with Rally Management Services aboard their 2013 KTM 450 Rally's last year for this video shoot in preparation for the UX Waterproof release. The crash featured is what broke both of Scott Brights arms as well this is the same bike he rode to a 53rd place finish at Dakar 2016 just a few months later! Talk about perseverance! We often get asked the question by newer riders of what they should/will expect performance wise after having their suspension properly setup for their weight and riding abilities. This is a very tough question to answer for us in simple terms other than it will "not deflect over square edge hits and bottoming will be improved significantly, it will be a more controlled compliant suspension action". We have sourced three sets of 2015 fork and shocks for a KTM 690 that we have setup and ready to ship for our customers to try out on their personal bikes. This will allow our customers to feel and see what the level of performance they can expect. 1. Email us to discuss your riding abilities, associated weights, and where in the country you live. We will ensure the appropriate springs are installed and setup accordingly prior to shipping. 2.. Deposit of $2000.00 is taken and held during the duration of time the customer is in possession, refund will take place once the suspension arrives back at Konflict Motorsports and inspected. 3. Suspension can be picked up at our shop, or shipped to your location. Shipping fee's apply. 4. Rental fee of $150.00 will be taken on top of the $2000.00 deposit, if suspension services at that time are arranged and deposit taken the rental fee will be applied towards suspension services. IF services are not arranged at that time, the rental fee will be applied towards balance. 5. Rental duration is for two weeks from date of receiving suspension, longer durations will acquire a $25.00 per day rental fee if not prearranged. Contact us at alex@konflictmotorsports.com or give us a ring at the shop at (425) 681-5160 for more details. Two days (175-230 miles each) of road-book routes through some of the best scenery and challenging terrain Washington has to offer! Two breakfasts, two lunches, and one diner + snacks and drinks. Bike Rentals: $300.00 per day. Rally Lite kits are available from RMS to utilize during the training. We can facilitate transportation, lodging, and camping equipment for the event, please contactalex@konflictmotorsports.com to discuss what details you require. Many other forms of off-road racing, involve a lot of mental training. You need to know how to manage your bike and body and learn to navigate using only a roadbook and compass heading. Spots are limited to a maximum of 12 riders, and will fill up quickly.